The inventor of the world's first clock is punished for trying to measure God's greatest gift. He is banished to a cave for centuries and forced to listen to the voices of all who come after him seeking more days, more years. Eventually, with his soul nearly broken, Father Time is granted his fre In this fable, the first man on earth to count the hours becomes Father Time. To ask other readers questions about The Time Keeper, please sign up. Is this book suitable to pre teen around 10/11yo? Michael Marstellar I don't think so. It deals with some heavy topics about death and time. it centers around a teenager contemplating suicide and an old man who doesn't…moreI don't think so. It deals with some heavy topics about death and time. it centers around a teenager contemplating suicide and an old man who doesn't want to die and lengths he'll go to (medically speaking) to continue his life. The book also focuses-in on how the pain that has been incurred upon humans from the counting of time. The mental aspect with time and death may become too sad and too much for a 10/11 year old to deal with yet. This question contains spoilers… (view spoiler)[The ending of the book. Help me pick my next read! 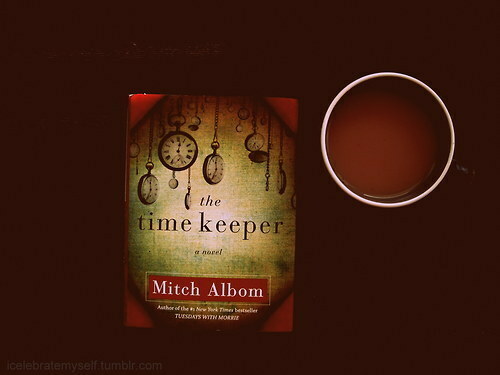 The Time Keeper by Mitch Albom has been on my excitement list for a while now. Such a great cover, an author I really enjoy, and a story about Father Time - how could I not be excited! What I expected and what I got were two different things, however. Instead of getting an interesting, complex story about a fantastical creature, I got instead chopped bits of a story, tossed together like a bit of a human salad, and mixed all up. This story is part Dor, part Victor, and part Sarah, but does not sp The Time Keeper by Mitch Albom has been on my excitement list for a while now. Such a great cover, an author I really enjoy, and a story about Father Time - how could I not be excited! This story is part Dor, part Victor, and part Sarah, but does not spend enough time with any one of them to make me, as a reader, feel connected to them. I felt a bit of pity for Sarah, was highly annoyed by Victor, and just.. confused by Dor (Father Time). That lack of connection took this book from something that, I was hoping, I would connect to and feel inspired by, to simply a story that, frankly, wasn't really that good. I think where this went wrong was the way the book was formatted, first of all (bold lettering making a statement before a paragraph about the character). This constantly jarred me and made me realize I was reading a book and kept the characters from fully forming in my imagination. Secondly, Victor and Sarah were just not very likable. Victor, an old, rich man who is dying after a full life, wants to find immortality, and Sarah, a teenager who has just been dumped by her first crush, is suicidal. It wasn't big enough for me, not real enough. Where are the people who have dealt with huge issues and struggling against depression - it's out there: the homeless, the abused. What about those who are working for good and want to continue to live to see that succeed? Oh, Dor…..Dor……Dor. You silly man. What possessed you to measure time? You screwed things up for the rest of us. Now we have to BE places at certain times and DO things until the time comes when we are allowed to go home. Why did you do this to humanity? Someone should imprison you in a cave for 6000 years and make you think about what you did, and not let you out until you are truly sorry. Dor was a curious man who lived 6000 years in the past. He wanted to measure th Oh, Dor…..Dor……Dor. You silly man. What possessed you to measure time? You screwed things up for the rest of us. Now we have to BE places at certain times and DO things until the time comes when we are allowed to go home. Why did you do this to humanity? Someone should imprison you in a cave for 6000 years and make you think about what you did, and not let you out until you are truly sorry. Dor was a curious man who lived 6000 years in the past. He wanted to measure things, like the movement of sun the moon and the stars. Back then there was little to do, no xbox, cable television with eleventy hundred channels to choose from, no internet……nothing. So he took up a hobby and discovered time. One day, the king of the land (a former childhood friend) came to visit Dor to ask him for his help on this tower he was working on. The king thought all of Dor’s gadgets he use to measure time would help bring power to his tower, since he was building it to reach heaven, but Dor refused. He just wasn’t that interested. This did not make the king happy so he exiled Dor. Dor and his wife, Ali, then went out on the road, leaving their children with some family, and on the way they met some strangers. Dor wasn’t too keen on them but his wife was very social, so they always shared a meal with these folks. Apparent Ali was the touchy, feely type and would hug all these strangers, though Dor warned her not to. Ali contracted a deadly disease and died, Dor was kind of upset. He stormed off towards the Tower of Babel and climbed the steps, he wanted to have a word with God, he wanted more time with his wife. God responded by sticking him in a cave where he didn’t age a day, didn’t need food, water or sleep for 6000 years. During these years, Dor got to hear all the people bitching about time. One day God decided that it was time to release Father Time (yup), but with homework. Dor was to help two people, yes only two after 6000 years, two very unremarkable and unlikeable people. Ehh, this was a typical Mitch Album book. You are supposed to learn a lesson from it, like in all his books. In this one you are supposed to learn not to take time for granted, not to rush it, not to wish it away and not to take into your own hands. It was a good book, but it didn’t move me like it was meant to. It in no way made me think differently about time. Love it, hate it, want more of, or less of it……time is what it is and it doesn’t give a crap about you, it’s going to keep moving forward whether you like it or not. Albom's fingers on the keyboard turn out golden prose, whether a column or a book. The Time Keeper is like a combination of precious metal. The story opens with Dor who lives four thousand years ago. (Edited to add that a person named Sidney who has a private profile complained in a comment 9 months after I wrote this review that I should warn there are spoilers. I don't think this review does, but you can stop reading now if you wish). back to the review... Albom's explanation of Dor's thought Albom's fingers on the keyboard turn out golden prose, whether a column or a book. The Time Keeper is like a combination of precious metal. The story opens with Dor who lives four thousand years ago. back to the review... Albom's explanation of Dor's thought processes in figuring out numbers and time is pure gold. The silver part of the novel is about a high-school girl named Sarah Lemon. She is lonely and unloved. She has a crush on a classmate Ethan. Sarah is eager for time to pass quickly before their first date. Soon, though, her heart is broken, as happens to unpopular lonely high school girls. Her life is tarnished. Our platinum character is Victor, the fourteenth richest man. Money, however, cannot cure him when he has terminal kidney cancer. However, he has come up with an alternative use for his money. Three very different, intertwined characters with different perspectives on Time. Will they meet? How, where, when? How will they influence each other? The answers to these questions are precious gems. In the beginning, I kept falling asleep while reading this book. By the time Dor was compelled to action for his two souls, I was able to push through to the conclusion of the book. I found it satisfying as it reinforces the importance of being in the moment and being grateful for those moments, whether they are good or bad. It reinforces the value of being interdependent with those we love and care about, that we need to be open and honest and fully present for them. I recommend this to others, In the beginning, I kept falling asleep while reading this book. By the time Dor was compelled to action for his two souls, I was able to push through to the conclusion of the book. I found it satisfying as it reinforces the importance of being in the moment and being grateful for those moments, whether they are good or bad. It reinforces the value of being interdependent with those we love and care about, that we need to be open and honest and fully present for them. I recommend this to others, but it does feel like you are reading a screenplay initially and it is hard to care about the characters when they are initially presented. It is in their most desperate of acts to manage time for their own purpose that I can relate to them best and feel how they needed one another to move forward to their true destinies. P 79- "It is never too late or too soon. It is when it is supposed to be." P 160- "when hope is gone, time is punishment." A short story before the review. You know, I have a friend. A very precious one. One, who knows many parts of me better than any other person. She, more than anyone else, knows how obsessed I am with time. Always was. I am always in time, always counting time and paying attention to it. It can be quite annoying. She gave me the book and told me to read it, or better ordered me to read it. This friend knew what this book would do to me. It changed some things forever. This is a story about Father Time. 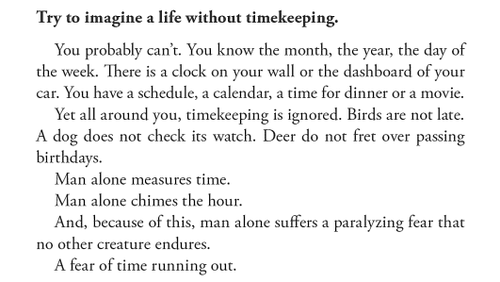 A story about a man named Dor who starts measuring time, something he better shouldn't do. He is the first one to notice time passing by. He becomes obsessed with time and he loses something. Something very important and after this loss he is banished in a cave. Alone, not aging, not changing, just hearing. He hears all the voices who speak about time, over 6000 years. Eventually, he is granted freedom again with a special hourglass and a unique mission: Teaching two people on earth the true meaning of time. One who wants more time, more than he is allowed to have. And one who doesn't want time at all. Who is ready to give everything up, especially the granted time. “You had many more years,” he said. The write style of this book was very simple, the sentences were kept short and precise, there was nothing complicated about them. Yet, there was something captivating about it. The shortness of the sentences was a strength of this book. The book showed three different people, with completely different lives. Each character made mistakes. Grave mistakes all of them had to pay for, but they were just normal human beings so their mistakes were just natural. They tried to overpower time and failed at it. There wasn't something like a real plot in this book. It was more the description of lives. This book showed a certain process without much tension in it. There was neither thrill, nor excitement in this book, but there was understanding and thinking and strength. This book was deep and it was powerful. It makes you think about life in general as much as about your own life-style. It makes you reconcider and probably even realize things you didn't before. I highly recommend this book to everyone. Just everyone, without exceptions. If I were to rate this book, I'd probably give it 2 stars. I feel bad doing that, though, so I'm just leaving it blank. It's not that it's a bad book. It's a nice little fable and has good intentions. Many will no doubt find it comforting and life-affirming. I just found it all a bit too obvious for my taste. Perhaps I'm just not one who feels I need a fable to remind me how precious our time on earth is, or how important it is to try to live in the moment. I'm all too aware of it every day. Rather quirky and unusual but still a light read, this is a story about Father Time and the man who discovered time in the first place. I enjoyed the way it was told in short chapters which circled around three different points of view. There was humour and there was sadness and there was a lot of philosophy about life and death, but it was never deep or hard to understand. I have not read any of this author's other (more famous) books yet but I certainly will now. This was an ideal book to read Rather quirky and unusual but still a light read, this is a story about Father Time and the man who discovered time in the first place. That one word that made me lose it and just cry - page 220, last line, last word - "Grace." 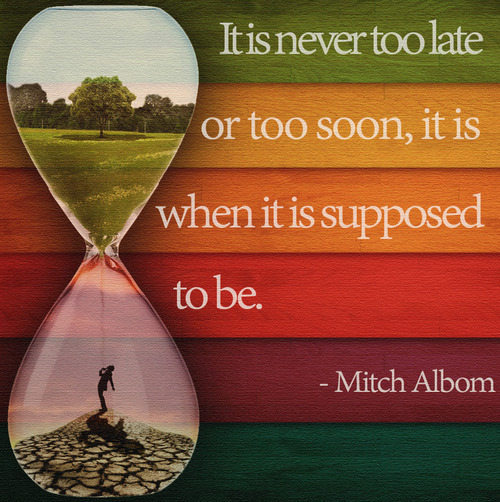 Mitch Albom has a way of capturing hearts with every word he writes and how he writes them. This book is not quite like the other books Albom has earlier written, but it is no less good. It is just as great as his earlier works, and I'm currently deciding if maybe, for me, this has been one of his better works. The Time Keeper is a light read. But it was still full of lessons like a typical Mitch Albom boo That one word that made me lose it and just cry - page 220, last line, last word - "Grace." The Time Keeper is a light read. But it was still full of lessons like a typical Mitch Albom book is - lessons that will keep you thinking, lessons that will fill your thoughts as you lay in bed at night, waiting for sleep to come. After reading an Albom book, I usually feel heavy hearted, sad but inspired. But this one was different. After having read it, I felt light-hearted, inspired just the same, but not sad. Death is a recurring theme in all the Albom books I've read so far, including this one. But The Time Keeper gave a lighter tone to it, which is maybe why I didn't feel heavy hearted when I finished it. The story in general was also lighter as compared to his other books. The characters were a bit more shallow. The conflict was not that deep. But this book is imaginative.I would not have expected Albom to write about Father Time. And I have a feeling that every now and then, when I feel like running out of time, or wishing to stand still in time, or wanting to go back in time, I'll be thinking of him, Father Time. Needless to say, this book was very well written. The clipped sentences. The sentences in bold letters. The short statements that ended every page,every chapter. I just love it all. Diction. Sentence construction. All of it. It feels all dramatic to me. "Once we began to chime the hour we lost the ability to be satisfied." It focuses on a man in the stone age - the first person to discover time - as penance he is forced to forever listen to the outcome of his discovery. That is - the human race constantly asking for more time. He is sent to save two people on Earth, in ord "Once we began to chime the hour we lost the ability to be satisfied." He is sent to save two people on Earth, in order to save himself from his eternal fate. These two souls are an old, ailing man suffering from a terminal illness and a teenage girl wanting to end her life. Father Time must show them both the meaning of time and what it is to truly live. Father Time was once a living man. His name was Dor and he was the first human to measure time. He lived 6,000 years ago when life and time were simpler. After a tragic illness took his wife, Dor wanted to reach the heavens and demand more time. The result of this action was the fall of the Tower of Babel and him being placed in a cave where he had to listen to any mention of time. Sarah is a girl in modern day New York. She wants time to speed up so that she can be with the boy who is showing i Father Time was once a living man. His name was Dor and he was the first human to measure time. He lived 6,000 years ago when life and time were simpler. After a tragic illness took his wife, Dor wanted to reach the heavens and demand more time. The result of this action was the fall of the Tower of Babel and him being placed in a cave where he had to listen to any mention of time. Sarah is a girl in modern day New York. She wants time to speed up so that she can be with the boy who is showing interest in her. Sarah believes that if Ethan spends time with her, he will see how wonderful she is. Victor is a millionaire in Manhattan. He is dying and wants to cheat death. Victor wants to freeze his body so that it can be healed of its cancer in the future and be given another lifetime to live. After 6,000 years, Dor is release from his cave and sent to modern times to save these two people. He must learn several lifetimes’ worth of information in order to succeed in this task. He must also determine what he is supposed to do to save them. The Time Keeper will take the reader on a spiritual journey through time. Why is time so important? Do humans spend too much of their precious time thinking about time? This story is told through the eyes of these three different individuals, but the story still flows smoothly as you move through time and locations. Readers of Mitch Albom’s other books with not be disappointed in this novel. 3 Lives collide in this tale about Father Time and how time affects all of our lives. Some want it to progress faster, and others want time to slow down. Many take time for granted and don't appreciate the chance that we all have to take a moment and savor these memories. Sarah Lemon, an insecure t 3 Lives collide in this tale about Father Time and how time affects all of our lives. Some want it to progress faster, and others want time to slow down. Many take time for granted and don't appreciate the chance that we all have to take a moment and savor these memories. Sarah Lemon, an insecure teen falls in love with a boy who doesn't love her back, and makes her feel terribly about herself. She wants her time to be over. Victor Delmonte is suffering from dialysis and cancer racking his body, he wants time to last forever. This is an entertaining little fable about time and how some people never have enough of it while others wish it would slow down. Dor is one who measures time and ends up in the role of Father Time. The other two main characters are Victor who has cancer and who is running out of time and Sarah who initially wants time to hurry up. Later events cause her to change her mind. Though it was entertaining and a quick read, this Mitch Albom story didn’t quite involve me the way a couple of his other b This is an entertaining little fable about time and how some people never have enough of it while others wish it would slow down. Dor is one who measures time and ends up in the role of Father Time. The other two main characters are Victor who has cancer and who is running out of time and Sarah who initially wants time to hurry up. Later events cause her to change her mind. Though it was entertaining and a quick read, this Mitch Albom story didn’t quite involve me the way a couple of his other books have. For someone who wants a light read that just really might cause them to think about time and their own lives this could be a worthwhile read. Sadly, I never connected with any of the characters in a meaningful way. Maybe that was the episodic way the story was told. Or perhaps it was just the theme of this one. It did remind me a little of the work of Jostein Gaader and it was a good change of pace from the book I had read before it. I enjoyed the concept but not so much the way it was written. One of those books, I suspect, you have to be in the right mood for. I will still definitely read others by this author and I am still glad I read this one. I picked up this book with great anticipation looking forward to turning each page. When I started reading I was frustrated with the style the author chose. I liked his other fiction stories and was expecting to find the same style amongst the pages. Then I found a totally different style and was disappointed. But I decided to keep going and this story is so worth the effort. The story follows Dor, Victor and Sarah. Dor lived during the early Bible times during the time of the tower of Babel bein I picked up this book with great anticipation looking forward to turning each page. When I started reading I was frustrated with the style the author chose. I liked his other fiction stories and was expecting to find the same style amongst the pages. Then I found a totally different style and was disappointed. But I decided to keep going and this story is so worth the effort. The story follows Dor, Victor and Sarah. Dor lived during the early Bible times during the time of the tower of Babel being built. Dor has an obsessive desire to figure out how long it takes for things to happen and invents ways to count and determine time. He winds up in a cave as Father Time where he spends eternity having to listen to people pray for more time. Victor is a wealthy man who is dying from cancer. He faces it the way he does everything else; he wants to find a way to beat death. He doesn't care what his wife thinks and is determined to find a way to live longer. Sarah is a teenager experiencing love for the first time. Her love interest doesn't seem to be as interested in her and makes her live so intolerable that she wants to end it. Uma escrita muito básica, quase parecendo dirigida a um público juvenil, sobre um tema supostamente profundo e filosófico mas tratado, quanto a mim, duma forma bastante superficial e previsível. A very plain writing, almost as if it were meant for young readers, about a supposedly deep and philosophical subject that was addressed, in my opinion, in a very shallow and predictable way. In this advanced copy of Albom’s latest book, he once again takes a simple theme, something we all think about, and he creates an inspirational, extremely creative avenue to explore it. The book is about time and how it affects our lives from moment to moment. We are all, each and every one of us, preoccupied with its measurement. What would life be like without the constraints of time? The book encourages us to think about how simple life would be if we were just enjoying the moment we were in, In this advanced copy of Albom’s latest book, he once again takes a simple theme, something we all think about, and he creates an inspirational, extremely creative avenue to explore it. The book is about time and how it affects our lives from moment to moment. We are all, each and every one of us, preoccupied with its measurement. What would life be like without the constraints of time? The book encourages us to think about how simple life would be if we were just enjoying the moment we were in, without thinking of all our other responsibilities in the next moment, the next appointment, the next day, the next problem. Three children are playing in a carefree manner, running through the fields. They are Nim, Alli and Dor. Dor is consumed with the need to measure, to watch and to investigate how things occur. Alli is a sweet and gentle girl who becomes his wife. Nim likes power and control and he becomes a powerful king who is sometimes a cruel ruler. Dor creates the forerunner to the sun dial. He is warned not to tamper with measurements by an apparition, but he ignores the warning. Later, when Dor refuses to help Nim build a tower to heaven, so he might defeat the gods and rule from above, Nim banishes him from his kingdom. Leaving his children behind with his parents, he and his wife Alli move away, dejected and lonely, they resettle elsewhere. When Alli falls gravely ill, Dor runs frantically to the tower that Nim is building, his stairway to heaven, and he climbs it, seeking to reach the top and force the gods to stop time and help his beloved continue to live. When he reaches the top, he is imprisoned in a cave by the same apparition that warned him, years ago, to stop experimenting with his measuring. This apparition is G-d’s representative. He tells Dor he must stay in the cave until heaven neets earth, until he basically learns the error of his ways, until he learns why he should not have inflicted the knowledge of time upon innocent victims. The three main problematic issues concerning the measurement of time seem to be these: wanting to extend time, wanting to slow time and wanting to stop time. Dor wanted to stop time, Sarah wanted to slow time and Victor wanted to extend it. The need to control it is the source of the problem. It is the need for a power that is not in the control of mortal man. Finally the day comes when heaven meets earth and the apparition reappears. Dor is instructed that he might free himself from the cave if he listens to the unending pleadings of the voices in the pool that was created by his tears, and chooses two to save, two humans who cannot deal with the time they have allotted or the circumstances within which they are living. Dor hears two voices above all others. Victor, 86, is terminally ill, and wants to find a way to give himself more time, Sarah, 17, is an unhappy, lonely teenager who has deceived herself and is being bullied by social media. She wants to end her time. Dor, himself, wanted to stop time, and the lesson he must learn, from his next trial, is why what he did was wrong. Using an hourglass and the sands of time, each is led to see the folly of their ways. Each learns that leaving the world, on their own terms, leaves those left behind to suffer. They realize that time is not in their control, should not be controlled and perhaps should not be given so much attention. They discover the drastic consequences of their own behavior and alter their paths. In that way, they also set Dor free and he returns to his own time to be with Alli in her last moments. Although 6 thousand years have passed, he is unaffected by its passage and is able to return to face whatever fate awaits him. Albom has created a fable about time, about who measured it, about why and how it was measured, and about the consequences for the measurer and those that eventually must live by the tools that measure it. He creates a fantasy about the problems created when we become preoccupied with schedules and the passage of time. He creates the legend of Father Time. For me, the ultimate message of this little tale is that although we live by time, and we want to control it, we do not own it, we have no power over it and we are helpless in the face of it. Time is the real prison for all of us. We need to live within the moment we have and not worry about the moment we don’t have, the moment that has passed or the moment that is to come. If we try too hard to control everything we do, we are consumed with the effort and lose sight of the actual living and of the enjoyment life provides. In the end, I was left with some questions. For instance, were the characters symbols of ancient bible characters? Was Nim the pharaoh in Egypt? Was the apparition the son of son G-d? Were Alli and Dor metaphors for Adam and Eve? Was the Mayan calendar the symbol of the end of days for Father Time? Why was Dor’s wish to learn about measurement of time more of a crime than Nim’s wish for power over the people? Weren't both really desirous of the same thing, control? Why was Alli’s act of kindness punished and not rewarded? Halfway through this I wanted to put it down and give up but I persevered. It started to change a little about the 3/4 mark and I thought finally.... But no the journey takes us to a sad place. Absolutely loved this. A beautifully sensitive tale and constructed in such a way that you just don’t want to put it down. And the moral? Tempus Fugit. Anyways... This book definitely deserves a good 5 stars from me. It really opened up my mind a lil bit of how I see things now. Time is precious, time is gold. We often saw people wasting their time; claiming it was nothing but just to pass time. Yes TIME. How many words can be used to be in a sentence with time? Many; but truthfully we know nothing bout time. Nothing compared to what we've claimed before. And, because of this, man alone suffers from a paralyzing fear that no other creature endures. A fear of running out of time." Some people wanted the time to go faster. Some claimed that they preferred it went by slower. But I believe everything happens for a reason. I liked the idea and the first chapters about Dor ad Alli, then I got somewhat bored afterwards and until the end! the ending was beautiful, but thats it. The first time I read a Mitch Albom book was in my “Sociology of Death and Dying” course during my university days. The above titled course naturally suggests that we read “Tuesdays with Morrie”. Ironically enough, Albom’s latest novel, “The Time Keeper” would have easily blended into the lesson plans of my other elective, “Myths, Symbols, and Rituals” due to the fact that it is a true example of a ‘creation myth’. If you are expecting a standard, fictional novel, then expect “The Time Keeper” t The first time I read a Mitch Albom book was in my “Sociology of Death and Dying” course during my university days. The above titled course naturally suggests that we read “Tuesdays with Morrie”. Ironically enough, Albom’s latest novel, “The Time Keeper” would have easily blended into the lesson plans of my other elective, “Myths, Symbols, and Rituals” due to the fact that it is a true example of a ‘creation myth’. If you are expecting a standard, fictional novel, then expect “The Time Keeper” to fall short. However, if you are familiar with Albom’s unique storytelling and successes at imploring philosophy, inspiration, and sometimes even theology while wrapped up in a fictional, fable-like concept; then you are in for a treat. “The Time Keeper” utilizes the imagery and symbolisms common to creation myths while uniting the lives of Dar (Father Time), Sarah, and Victor. Although each character’s story is somewhat thin, they blanket together to form a thicker depth which causes self-evaluation from the reader. Although not in a standard way, the characters grow and incite reader remorse and emotion. 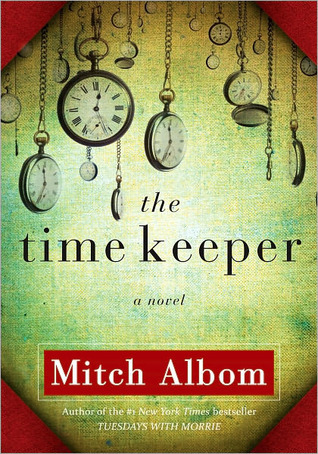 One of the major highlights of “The Time Keeper” is Albom’s creativity regarding the plot. Although simple and not overly emotionally complex; the mythical elements encourage depth and page turning. In fact, the pace of the novel is a hearty heartbeat which seems to come alive as the story progresses. “The Time Keeper” has many moments filled with inspirational lore, yet they aren’t pushy or melodramatic. Basically, although not realistically conceivable; “The Time Keeper” is still approachable. The format of “The Time Keeper” may be interpreted as choppy because it bounces between the three central characters but Albom answers all questions with time. The last ¾ of “The Time Keeper” is somewhat cheesy and not as moving as the former portions of the book. Indeed, one could argue that Albom fashioned a rather predictable ending. Nevertheless, the last two pages caused me to tear up slightly but this was more because of my own projected feelings than due to the story itself (however, since “The Time Keeper” cause my inner experiences to be stirred; it can be congratulated). “The Time Keeper” left me noticing my own feelings towards and of my handling of time which was more than likely Albom’s intent. Plus, on a side note, the novel is a very fast read (one day, at the most) which helps not “waste” time! “The Time Keeper” is suggested for a creative, quick, and inspirational read. I’m sure my old “Myths” professor is altering her current syllabus as we speak. A waste of a cool idea, and the description is inaccurate. This is bad YA Christian fiction with insufferable characters. It's a 200-page (if you include the 100 white pages) preachy cliche. Tons of references to God's will and God's gifts. The first man to measure time is a "sinner" because...he measured time. Yes, mankind was much better off 6,000 years ago before everyone started thinking and inventing and whatnot. Other characters include - Victor, the rich finance type who shouts things like A waste of a cool idea, and the description is inaccurate. This is bad YA Christian fiction with insufferable characters. It's a 200-page (if you include the 100 white pages) preachy cliche. Tons of references to God's will and God's gifts. The first man to measure time is a "sinner" because...he measured time. Yes, mankind was much better off 6,000 years ago before everyone started thinking and inventing and whatnot. Other characters include - Victor, the rich finance type who shouts things like "I paid good money for that! "; Sarah, the chubby 17-year-old with daddy issues who thinks like a 6-year-old and hates herself because the cute boy is mean and doesn't love her; Sarah's mom, who is a single mom and is just doing her best but darn it why won't her teenage daughter confide in her? ; etc. 'Čuvara vremena' mogli bismo nazvati svojevrsnom modernom poučnom bajkom. Ova kratka knjižica govori o Doru, prvom čovjeku koji je naučio kako mjeriti vrijeme i pratiti tok vremena - 'izumitelju' vremena, recimo to tako, onome koga obično poznajemo pod nazivom Otac Vrijeme. Dor je živio u vrijeme kada se, prema biblijskoj priči, gradila kula babilonska, a njen je graditelj bio Dorov prijatelj iz djetinjstva, Nim. Dvojica dječaka koja su zajedno odrasla posvetila su se posve drugačijim životnim put 'Čuvara vremena' mogli bismo nazvati svojevrsnom modernom poučnom bajkom. Dor je živio u vrijeme kada se, prema biblijskoj priči, gradila kula babilonska, a njen je graditelj bio Dorov prijatelj iz djetinjstva, Nim. Dvojica dječaka koja su zajedno odrasla posvetila su se posve drugačijim životnim putevima: jedan je htio dosegnuti nebesa i pobijediti bogove, dok je drugi bio potpuno zanesen mogućnošću da izmjeri i određuje vrijeme. Kada je Nim, shvativši da Dor ima određeni izumiteljski dar, pozvao Dora da mu pomogne u gradnji kule, Dor ga je odbio i zajedno sa svojom ljubavi iz djetinjstva, Alli, pobjegao u planine kako bi izbjegao eventualnom Nimovom bijesu. No, Dorova i Alliena sreća imala je, nažalost, ograničen vijek trajanja, jer uskoro je Alli podlegla nekakvoj bolesti, a Dor je pohitao popeti se na Nimovu kulu ne bi li zamolio bogove da zaustave vrijeme dok on ne pronađe načina da spasi Alli. Ova priča o vremenu kratka je, jezgrovita i u sebi nosi važnu poruku: da teba cijeniti svaki trenutak života, jer svaki je dragocjen, a ne tratiti vrijeme neprestano ga mjereći, žureći, gledajući na sat. Načinom na koji je ispričana, ova priča podsjeća na bajku, jednu od onih poučnih bajkovitih priča u kojima ljudi prolaze kroz određenu kušnju ne bi li shvatili određene životne činjenice koje su im zapravo cijelo vrijeme bile pred nosom. Ova priča o vremenu kroz isto to vrijeme neprestano vijuga: proteže se u prošlost, opisujući početke mjerenja vremena i ljudskog shvaćanja da vrijeme prolazi, vraća se u sadašnjost u kojoj vrijeme za dvoje ljudi u fokusu priče sve brže istječe, te u par navrata ulazi i u budućnost, pokazujući utjecaj koje će pojedine odluke donesene danas imati na vrijeme koje tek dolazi. Ovakav način pričanja pomalo podsjeća na Dickensovu 'Božićnu priču', samo što ovdje u ulozi duhova Božića prošlih, sadašnjih i budućih imamo Oca Vrijeme. Pogled na vrijeme koji u ovoj knjizi iznosi njen autor vrlo je intrigantan i daje vam puno materijala za razmišljanje. Pročitavši Dorovu priču, zapitat ćete se ne činite li i vi ponekad isto ono što je činio i Dor i drugi likovi u ovoj knjizi: neprestano žrtvujete vrijeme koje imate radi nekog budućeg vremena koje možda zapravo nikada nećete niti imati prilike iskusiti. Albom nam ovom knjigom želi poručiti da je možda vrijeme da prestanemo živjeti u prošlosti, ili za budućnost, već da počnemo živjeti u sadašnjosti, u svakom trenutku u kojem se nalazimo i da svaki taj trenutak počnemo cijeniti. This was a shorter book, but it took me awhile to get through it. I’ve previously read two other Albom books (The Five People You Meet in Heaven and The Magic Strings of Frankie Presto), both of which I enjoyed so I was looking forward to this read. The premise was intriguing - “Father Time” (the man who first begins tracking time) is trapped in a cave for 6,000 years, has to listen to humanity complain about time, then he’s sent to Earth to help two people - an 80 year old millionaire who is dy This was a shorter book, but it took me awhile to get through it. I’ve previously read two other Albom books (The Five People You Meet in Heaven and The Magic Strings of Frankie Presto), both of which I enjoyed so I was looking forward to this read. The premise was intriguing - “Father Time” (the man who first begins tracking time) is trapped in a cave for 6,000 years, has to listen to humanity complain about time, then he’s sent to Earth to help two people - an 80 year old millionaire who is dying and a teenage girl who wants to die. His mission, that which will finally allow him to die/pass on, is to help these two people. وقتی کسی عمرش را اندازه بگیرد، دیگر زندگی نمیکند. A two-day vacation deserves a novel to be read, so I read Mitch Albom's The Time Keeper. The story is about a man who was disciplined (I might as well use the word "penalize" lol) for measuring one of God’s greatest gift: TIME. His punishment is to teach two seemingly random people the true meaning of time. The first person is a teenage girl who wants to give up on life, and the other is a wealthy businessman who wants to live forever. The story was able to get its message across; that TIME is pr A two-day vacation deserves a novel to be read, so I read Mitch Albom's The Time Keeper. The story is about a man who was disciplined (I might as well use the word "penalize" lol) for measuring one of God’s greatest gift: TIME. His punishment is to teach two seemingly random people the true meaning of time. The first person is a teenage girl who wants to give up on life, and the other is a wealthy businessman who wants to live forever. The story was able to get its message across; that TIME is precious and we should always use and spend it well.